Juicy. Ombre. Lemonade. Sunset. 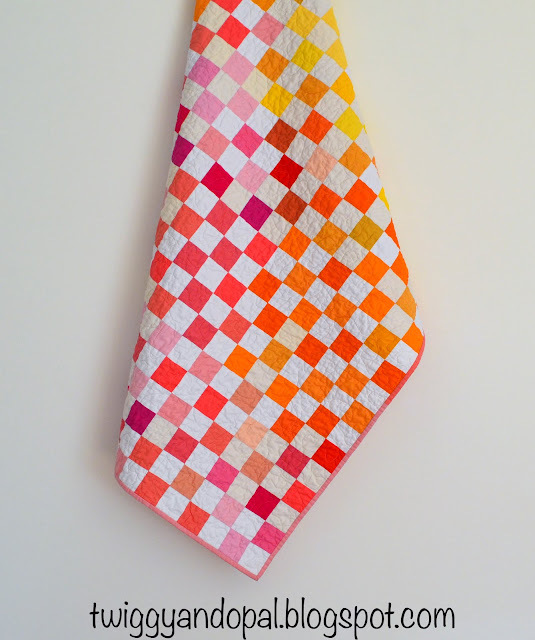 This quilt has conjured up all kinds of visions from the colors sprinkled throughout. It all started with one quilt: Regatta. My version of Block M Quilts pattern (this is my version: Regatta) has been done for a while, but there was some extra 'scraps' that needed my attention. The scraps left from my quilt were cut from stripes to squares. I didn't have enough, but it was easy enough to make more for this quilt. It helped a lot that Jelly Roll strips were used! I pieced together a fun binding to flow with the gradient shades of color. Its never a bad thing! I fiddled and adjusted until I had the right amount of 'ombre' happening. I think that was the easy part really. 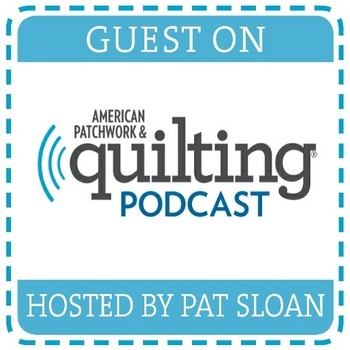 It wasn't until it was time to quilt that I wondered what to do. But then again...it was the perfect opportunity to practice with stippling. Stippling! 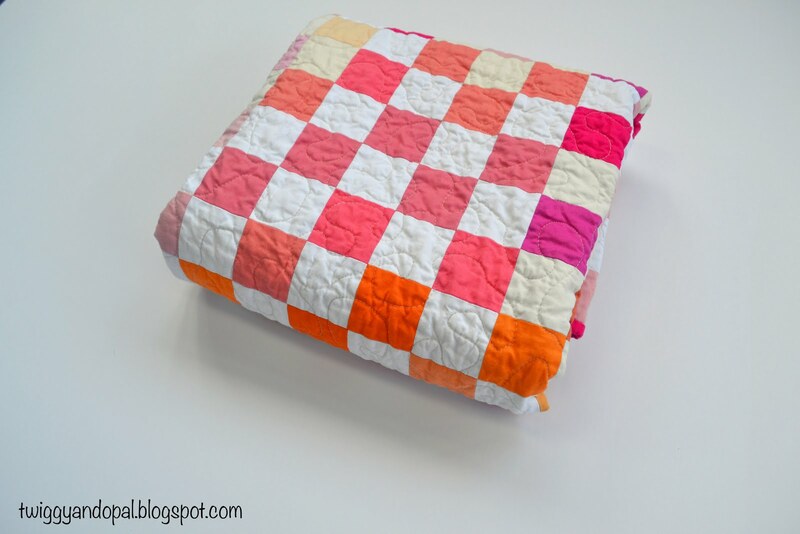 I figured this was as good a quilt as any to try Free Motion Quilting. It is a pretty busy quilt that would lend itself to the all over Stipple effect. Could I go wrong?! Would I remember how to do it? That is debatable! I'm not gonna lie...I did not practice before I threw this quilt on the machine. What could go wrong?! It felt quite awkward, yet somehow familiar. I tried to be fluid with my motion. Smooth. Perhaps a glass or two of wine would have helped. It certainly wouldn't have hurt! I only crossed over lines a few times! Hallelujah! I didn't care, no one was going to notice when it was all said and done. Fluidity of the lines proved to be much harder than I thought though. I maybe should have practiced! There were some not so curvy curves, more like pointy curves! But, I expected as much! I knew that it wouldn't much matter after the 'crinkle' effect happened with the wash. The effect was exactly what I was after and exactly what I got. I'm not in the least disappointed with my quilting on this. What amazed me was just how fast a quilt this size got quilted using Stippling! Damn! Seriously! I would say an hour. One hour! I may have to use this more often! Are you a Stippler? If you have any tips, I'd love to hear them...just don't say practice! This isn't a mind blowing, out of this world quilt to share. But I did want to share the quilting. I know just how hard it is to come up with quilting ideas. I know just how hard it is to Free Motion quilt. What I mainly want to share is regardless of your abilities, if you don't try you can't learn. And, sometimes it's okay when things are not perfect. It doesn't take away from the quilt or your creativity. You don't have to be perfect to be amazing! Looks like a big bowl of sherbert-yum! I love it! First of all thank you for not saying to practice with FMQ! Now doodling I can do! Second, thank you so much for your kind words on my quilts. I love experimenting with color and techniques. Most of the time my quilts become happy accidents, which has always worked out for me. I usually design as I go and see where it leads! Hey, and I have a question for you, since you mentioned using jelly roll strips. 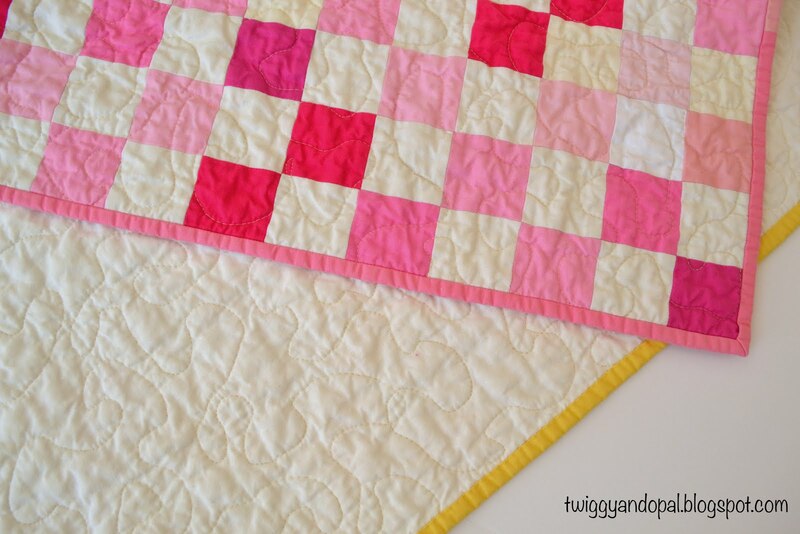 When you quilt with precuts, do you use them as is with the pinked edges, or do you trim them down? Do you prewash them at all? I bought a bunch of precuts on impulse and I'm not sure what to do with them. But I did notice that they are not always cut perfectly on grain, which annoys me! That turned out so beautifully, Jayne! I love the way the color flows through it. Way to go on your quilting, too! 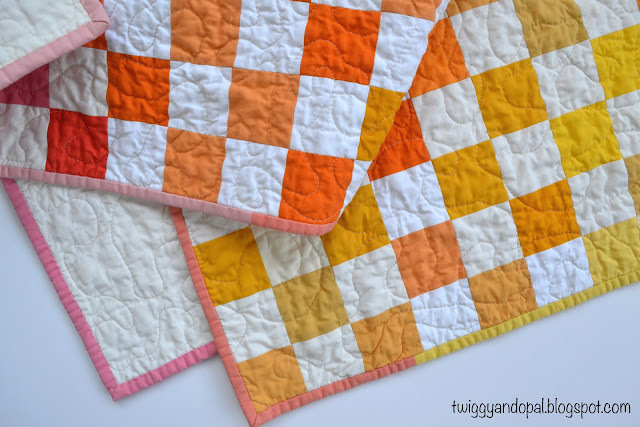 I figured this was the perfect quilt to practice FMQ with! I’m still shocked at how quickly it was finished using stippling! I had far too many points mixed in with my curves too! But it was fun! I love stippling. 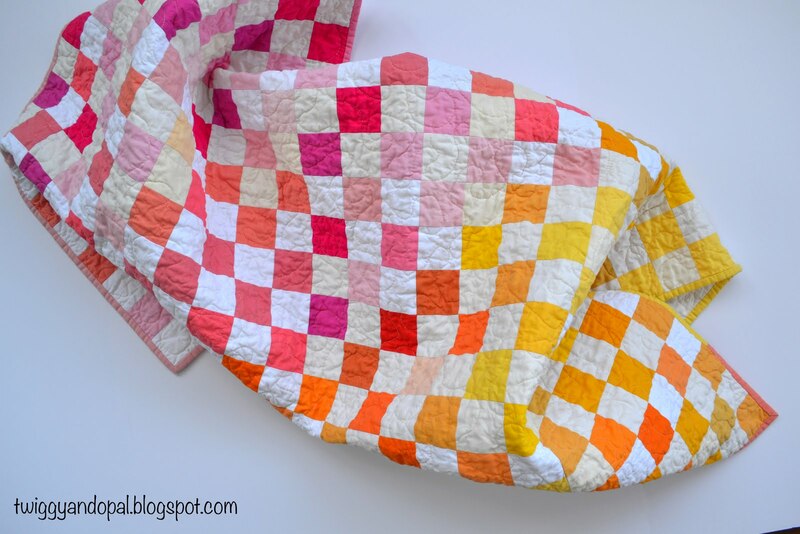 It's quick and gives such a great crinkly look to a washed quilt. I hadn’t done stippling in a long, long time! But I was shocked at how quickly I was finished! Makes me want to do it more often, and the crinkle is unbeatable! In terms of not practicing, just doodling the design on paper for a minute or two just before starting quilting is usually enough to help calibrate you for the motion you are looking for. Lovely, bright finish! That's the dirty little secret of stippling: we use it cuz it's FAST! :) But you also remembered that the crinkle texture after washing is so, so yummy. Here are my stippling tips: don't worry about making every curve into that "jigsaw puzzle piece" shape. Let your mind think about cursive capital E's, gingerbread boy legs, dog bones...whatever curvy shape pops up. And don't be afraid to just do a wiggly/slightly curvy line that travels to another section. If I get trapped into an area and need to get out, I just wiggle out. Fill in a big open space with about 3/4 of a circle, then wiggle out. Curve, curve, E, dog bone, wiggle wiggle wiggle. It all works! I also don't worry too much about getting the stipple all the way to the edges of the quilt. It's really easy later to sew another wiggly line off and on the edge of the quilt top and into the exposed batting. That will hold the edge down and after the binding is on, it just looks like more stippling. Oh! And something I learned on my last stipple where I was having a bad time with skipped stitches: if you need to rip a section out, it's fine to not replace that section! The stipple will stop and then restart 2-4 inches away and that's just fine. 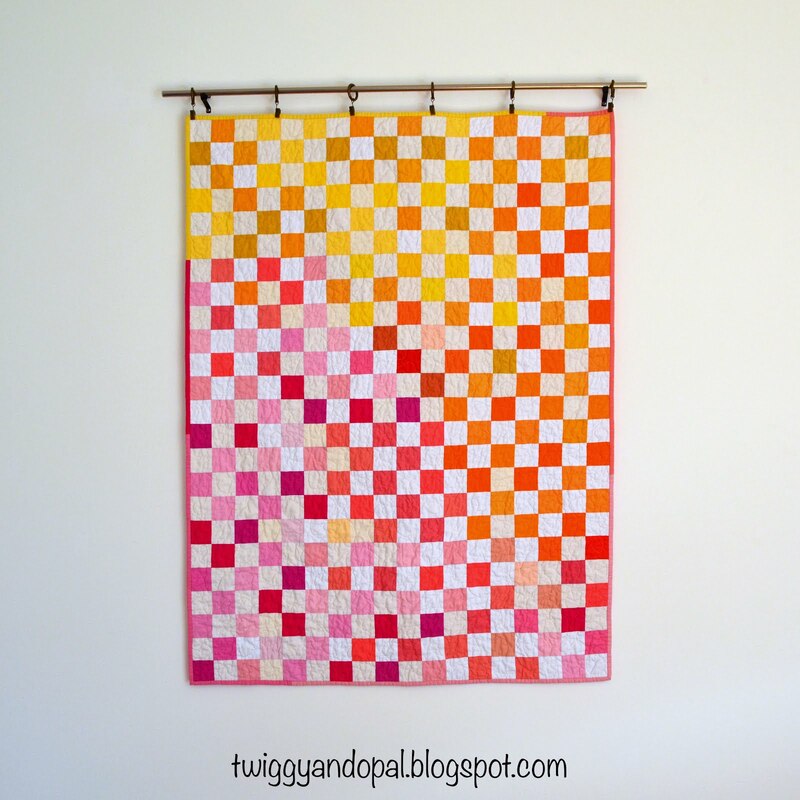 While it's fun to think, "Hey, I could quilt this with one very long line!" no one will notice a few starts and stops as long as the ends are buried. Done and done! Your quilt reminds me that strawberry season is coming...and wonderfully fresh strawberry lemonade! Yum!! If you cross over a line once on stippling it is an error. Do it more than once and it is a design element! Who says it is "wrong". So glad you linked this beauty up with Oh Scrap! Quilt to music - a Viennese waltz is my favourite! Or Shostakovich' Jazz Suite. You'll just float around your quilt in a swirl of grandeur and romance and it'll be finished even faster! I’m craving a glass of berry lemonade right now—or maybe a pack of fruit stripe gum (the kind we used to make gum wrapper jewelry out of). I can’t imagine why. This quilt just sparkles. I wonder if we are most comfortable with what we first learned. Stippling was the first machine quilting I did, so that’s what I love. I can really get in the zone. Straight line walking foot quilting scares me but seems so natural for you. My tip is to relax (don’t hold your breath) and get the feel and rhythm of the size of stipple that works best for you. (I do best with smaller for the smoothest curves, but that’s just me.) Also experiment to see what general direction feels best. I tend to quilt away from myself. I can see better where I’ve been. And it all looks and feels fabulous after washing. No picking out stitches needed. Simple yet gorgeous! Love it! I love the simple squares of the quilt. The colors - so vibrant - and the layout. Don't tear yourself down. It is "mindblowing" - probably depending on your definition of that but it is very inspiring and beautiful! The colors in this are wonderful, and yes - love that binding on it! Stippling is so versatile, working well from big and loose to microfill size. I always try to fix my mind on the size of an everyday object (or finger, perhaps) to keep in mind as I free-motion to help more with keeping the spacing somewhat uniform as I work through the quilt. I love this one! And stippling is not in my skill-set yet. AT ALL! ;-/ So yay you! It's a beautiful burst of sunshine. Stippling is for sure not my favourite. This is lovely! It reminds me more of orange raspberry sherbet - another name idea to consider. Love your stippling. It's one of my favorite fills, though I think it gets a bad rap these days, as it's not considered modern. But there are so many times that it works, especially here. Well done! Ooooh, Susan may be right! Just name it "Sherbet"! It's darling and your stippling is fine. I happen to think practicing FMQ with a writing tool is the not best way. I think muscle memory is hard to translate. I would use an old needle and cheap paper, and keep at it on your sewing machine. The paper has hardly any resistance and you can concentrate on just getting the design down rather than moving your fabric. I use to stipple on my sit down, and had another learning curve moving to the longarm. Going back to the sit down makes me laugh at how hard it is, but it's really some quick practice for that muscle memory to kick back in. Does anyone else recognize their own stippling when compared to someone else's? I think they appear fairly individual to the sewist.